Key Difference: The words Metropolitan and Cosmopolitan is very commonly said to term a city and has a slight difference between them. The main difference being that Metropolitan city refers to large city with high population and numerous employment opportunities which is linked with near-by in both social and economic terms, whereas Cosmopolitan refers to large city with diverse population and backgrounds living together with broad-mindedness. Metropolitan is also defined as being large city and high population with numerous employment opportunities. In India, the Census Commission defines the qualification for metropolitan city as, “ the cities having a population of more than 10 lakhs or one million and above” and a Megacity as “ the cities having a population of more than 10 million and above”. The metropolis is the chief town or city of the region or country. The metropolitan area is a vast continuous urban area, with major city at the centre and surrounded by suburban districts, adjoining towns or cities, townships, semi-urbanised villages, etc. The word Cosmopolitan is derived from the Ancient Greek, Kosmospolites”. Kosmos means the world or universe or cosmos and Polites, which means citizen or one of a city. The contemporary usage defines citizen of the world. The word Cosmopolis means centre of and for people of the world, their ideas, art and other cultural affairs. Thus, a cosmopolitan city can be understood as the city which hosts people coming from different ethnicities, beliefs and culture. This means that it is a all accepting global city that is built on the foundation of the culture coming and making the city great. The word cosmopolitan also be used as a term for a person who has lived and traveled in many countries and especially free of national prejudices. A cosmopolis can be a person, town or city. A cosmopolitan city is which has large population from various cultural background and nationalities. large and high population with numerous employment opportunities. large city with diverse population and backgrounds living together with broad-mindedness. It is possible for a city to be both Metropolitan as well as Cosmopolitan City like for example Mumbai in India or New York in the US, whereas a Metropolitan city may not be a Cosmopolitan like for Example Surat in Gujarat, India. 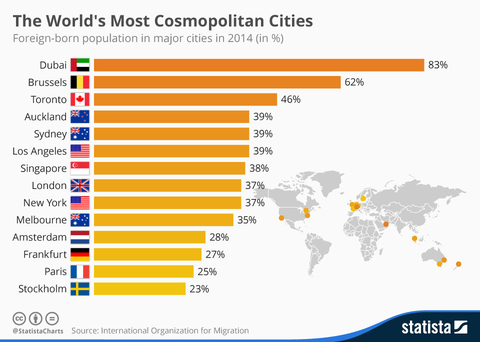 Cosmopolitan city is a city that has worldwide scope or applicability. 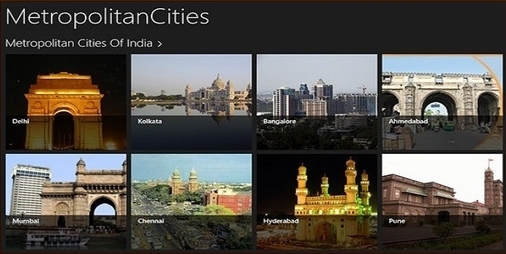 Metropolitan City is a city with densely populated people in the urban area.